Cyber Monday- one of the greatest days of the year! I did a little shopping online on Friday because fortunately stores have realized that it's smart to offer good deals online all weekend to avoid the craziness and people trampling each other in the stores! I'm the last person to fight over items or stand in long lines so online shopping is truly my BFF! Here are a few of my picks from some great stores! 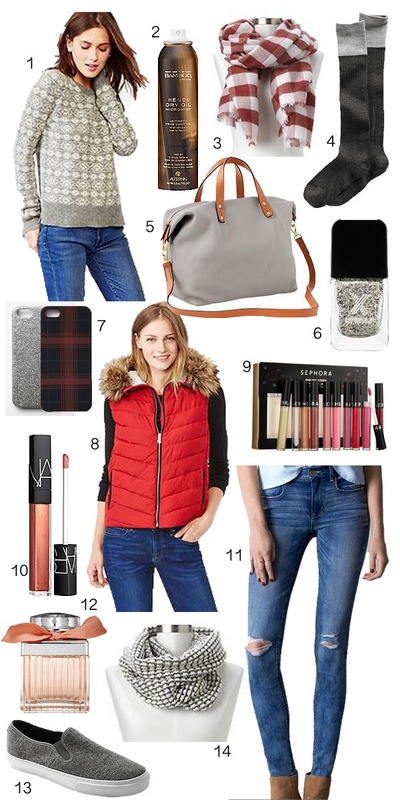 Now here's the beauty of this wish list- you could win all these items by entering the Coupons.com Cyber Monday Sweepstakes! Winners will be chosen to receive giftcards to The Gap, American Eagle, Sephora, and many more of my favorite stores! Make sure to check out Cyber Monday savings articles on The Good Stuff and happy shopping! I don't know how I missed that duffle! So many great finds here! Love the bag! Yay for shopping from home, and not having to fight the crazy crowds.